A vulnerable man collapsed and died of heart failure after spending most of a large benefits payout on drugs. Jamie Rosengren from Bristol, who had a history of mental health and drug problems, died weeks after getting a £10,000 backdated disability payment. 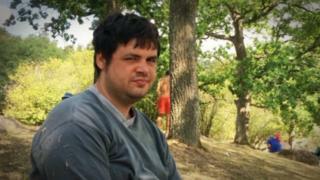 A Bristol inquest was told that Mr Rosengren, 28, suffered a cardiac arrest on 22 October. The court heard when paramedics arrived they were told he had been on a "£9,000 drug binge" over the previous week. Traces of cocaine were found in Mr Rosengren's body after he died. His family believed he had been exploited by drug dealers, and questioned the decision to give someone with his history of problems such a large amount of money. Mr Rosengren was a diagnosed paranoid schizophrenic and in the care of Avon and Wiltshire Mental Health Partnership (AWP). But despite having been previously sectioned, he won a tribunal to live in unsupervised social services accommodation. Mr Rosengren received the lump sum of £10,296.80 on 26 September, and in just over three weeks he was nearly £800 overdrawn. His father, Ernst Rosengren, told the court that drug dealers were "calling around the clock as word spread that he had money". He said: "I believe that Jamie could have been saved. Many mistakes were made without thought or consultation with his family." Housing charity Second Step had assessed him for the accommodation and support he received, and helped him to apply for the benefits payout. Giving evidence, the charity's Tim Day said Mr Rosengren had admitted to staff he had spent a lot of the money on drugs. As a result of concerns raised by Second Step and his parents over his safety, the AWP made an unplanned visit to check on Mr Rosengren's welfare. AWP consultant psychiatrist Pradeep Agrawal told the court Mr Rosengren had asked him not to share information with his parents, except that to say he was taking his medication and doing well. "He may have made bad choices but you can't force him to do things. It's his right to make unwise choices," he added. Assistant coroner Myfanwy Buckeridge said: "Jamie was an adult able to make his own decisions." The coroner concluded that cardiac arrhythmia caused by cocaine use was the most likely cause of death. Following the inquest, Second Step said it was "deeply saddened" by Mr Rosengren's death, and would be conducting a review of "processes and procedures". A Government spokesperson for the Department for Work and Pensions said: "Our thoughts are with Mr Rosengren's friends and family at this difficult time. We work to ensure that people get the full financial support that they are entitled to, alongside the care provided by local health and social services."